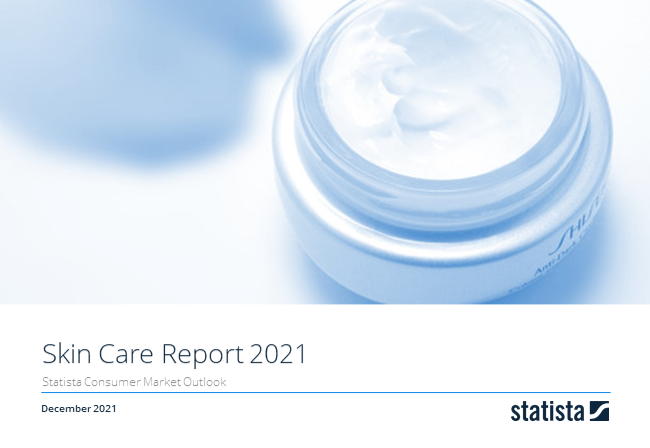 Revenue in the Skin Care segment amounts to US$341.1m in 2019. The market is expected to grow annually by 2.9% (CAGR 2019-2023). In global comparison, most revenue is generated in China (US$26,573m in 2019). In relation to total population figures, per person revenues of US$3.50 are generated in 2019. The Skin Care segment includes cosmetic products designed for care and protection of the skin. These include all types of creams and lotions, as well as sunscreen, for face, hand and foot care. These products are not primarily used for decorative purposes (see: Cosmetics) or cleaning (see: Personal Hygiene). Excluded are skin treatment products with a health focus, e.g. acne treatments, which are shown in the Consumer Market Outlook as part of OTC Pharmaceuticals. In contrast to other consumer goods markets, this segment benefits from demographic changes which, in the medium term, contribute to growth of use of these products by different target groups. Major manufacturers are L'Oréal and Beiersdorf. Reading Support Revenue in the Skin Care segment amounts to US$341.1m in 2019. Reading Support The Skin Care segment is expected to show a revenue growth of 3.9% in 2020. Reading Support The average revenue per person in the market for Skin Care amounts to US$3.50 in 2019. Reading Support With a market volume of US$26,573m in 2019, most revenue is generated in China. Here you can find more studies and statistics about "Skin Care".